Providing you the best range of designer upvc window and upvc sliding window with effective & timely delivery. We provide a wide range of Designer UPVC Window. These are available in a range of colors, sizes, designs and they have been made using the best technology available in the market and they have been made using a high quality of raw materials which have been bought from well-known vendors in the market. They are exported to the customers all over the globe and they have been priced at cost effective rates. 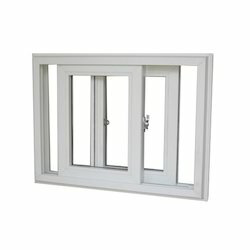 Offering a wide range of UPVC Sliding Window. The range of products which we manufacture, supply and exported to the customers include the UPVC Sliding Window which are available in a range of sizes, designs, colours and they are installed in homes, offices and various other buildings as per the customer requirements. These are made from high-quality raw material.